Life is finally starting to settle after the holidays and I'm quite relieved. As much as I love sharing those moments with my family, I feel like I need some time to breathe! Every once in a while I get up early to get in some "me" time. This particular day I decided to get dressed up and take a walk at one of my favorite local spots. This Unique Vintage swing coat has been my go-to this winter. The silhouette it creates and the fit of the bodice is perfection! You can read about this lovely coat (and the dress underneath it) below. 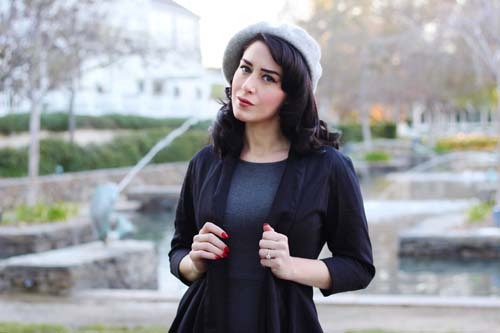 The Bordeaux Dress Coat is a great piece to complete your outfit. While it's not necessarily intended to be worn to keep warm, it does provide an extra layer. In my forever state of dry heat, this coat is perfect for those chilly nights. It features side pockets, a covered button closure, and a full swing skirt. I paired it with the Mod Wiggle Dress in grey. This is my first Mod Dress but it certainly won't be my last! It's incredibly stretchy yet has enough structure to enhance your curves. You can actually step right into it, thanks to the full back invisible zip. Because we all know there is nothing worse than having your hair and makeup ruined trying to put on a dress! I got a size small in both these pieces and they were both the perfect fit. If you haven't already indulged, Unique Vintage is having a 25% off sale on full priced items with the code KBYE. You can get this outfit on sale right now! Bianca's birthday is in less than two weeks and I am pretty much a mess! We're planning a family Disneyland trip (it was her request) but I wanted to do something small for her actual birthday as well. I can't believe I'm about to have a three year old daughter! Where the heck does the time go? Holiday Gift Guide: After Christmas Sales!